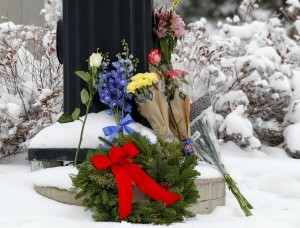 WASHINGTON — The man accused of killing three people at a Colorado Planned Parenthood clinic brought several guns, ammunition and propane tanks that officials say he assembled around a car. For hours, he holed up inside the clinic, unleashing a fusillade that wounded nine others and sent shoppers scattering inside surrounding buildings during a standoff with police. Police have refused to detail a motive in the Friday killings of one police officer and two civilians at a Planned Parenthood clinic in Colorado Springs, though one law enforcement official said Dear said “no more baby parts” during rambling comments after his arrest. Dear used a rifle in the shooting and also brought other firearms and ammunition, according to a law enforcement official familiar with the case who was not authorized to talk publicly and spoke on condition of anonymity. Colorado Gov. John Hickenlooper has called the killings a “form of terrorism,” and Planned Parenthood has said witnesses believe the gunman was motivated by opposition to abortion. But Dear also has been described by acquaintances as a loner who once gave neighbors anti-Obama literature but never any indication he would target a clinic. There’s no statute for prosecuting domestic crimes motivated by extremist ideologies and no catchall “domestic terrorism” charge or offense in the federal criminal code. Federal authorities have the option of filing charges but haven’t said whether they will do so, though a coalition of advocacy groups is calling on the Justice Department — which is reviewing the case — to investigate violence against abortion clinics as domestic terrorism. Among the federal government’s potential avenues is a 1994 law known as the Freedom of Access to Clinic Entrances Act, which makes it a crime to injure or intimidate abortion clinic patients and employees. Federal law defines domestic terrorism as dangerous acts that take place inside the U.S. intended to intimidate the public or coerce government policy or conduct — a description meant to encompass, among others, anti-government anarchists, white supremacists and animal-rights activists. But the actual charges vary. In the 1995 Oklahoma City bombing, for instance, Timothy McVeigh faced charges including conspiring to use a weapon of mass destruction, malicious destruction of federal property and the murders of law enforcement officials. A Florida man in 2012, meanwhile, was sentenced to 10 years in prison on charges of arson and damaging a reproductive health facility after firebombing an abortion clinic. While the Justice Department consistently charges individuals who look to join organizations like the Islamic State group with providing material support for a foreign terror organization, there’s no comparable statute for prosecuting domestic crimes motivated by extremist ideologies and no catchall “domestic terrorism” charge or offense in the federal criminal code. That lack of clarity can make it hard to count the number of domestic terror prosecutions, or differentiate that crime from other illegal activity, according to a 2013 Congressional Research Service report. “Individuals considered to be domestic terrorists by federal law enforcement may be charged under nonterrorism statutes, making it difficult to grasp from the public record exactly how extensive this threat is,” the report said. The issue arose in July when the Justice Department brought federal hate crime charges against Dylann Roof in the massacre a month earlier at a black church in Charleston, South Carolina. The Justice Department in the last year has stressed that it takes the domestic terrorism threat as seriously as it does international terrorism. Last year, it revived a domestic terrorism executive committee that had fallen into disuse after the Sept. 11, 2001, attacks as the government shifted focus to international terrorism. More recently, officials appointed a domestic terrorism counsel to coordinate the flow of information. Heidi Beirich, director of the intelligence project at the Southern Poverty Law Center, said Dear “should be charged with crimes that take him away forever” and that the federal government has many tools to do just that.